N.A.P. carries a next generation closed-cell spray foam insulation which utilizes Innovate 245 as its blowing agent. In 2005, Federal mandate eliminated the use of CFC's from use and a new product 245 was substituted and validated as a non-depleting ozone agent. The initial spray foam systems were difficult to engineer and provide cost value systems which maintained the physical properties desireable and the yield/cost of these systems. GACO 173 spray foam offers even better charactaristics for storage, spraying, visual appearance, odor emmissions, adhesion and a wider range of temperature for application. GACO 173 spray foam is a class 1 spray foam (highest standard for all products sold from NAP, which is not necessarily the standard for all distributors) which lays like pour foam and yields 5000 to 6000 board feet per set. A balanced system which means odors are very low and that the A & B sides are equal in volume. BASF Spraytite spray foam is also a class 1 spray foam and yields 4000 to 4800 board feet per set. If you are not using this product, you are not giving your customer, nor yourself the best product available while in process and the final life of the end product! Call N.A.P. regarding the particulars in your area. WE ARE LOOKING FOR REGIONAL DISTRIBUTORS WHICH UNDERSTAND SPF. QUALIFIED CANDIDATES MUST HAVE A STRONG BACKGROUND IN EQUIPMENT ,CHEMISTRY AND APPLICATION OF THESE PRODUCTS IN RESIDENTIAL AND COMMERCIAL USE. PENDING SALES, A LOCAL WAREHOUSING SITUATION MAY BE NECESSARY WITH CLIMATE CONTROL BETWEEN 65-80 DEGREES F.
Download GACO Wall Foam Brochure. The MSDS & Product Data information contained in the links above are provided by the material manufacturers. North American Processing does not guarantee the accuracy of the information supplied to us by the manufacturer. Spray Foam Insulation redefines construction methods, benefits modern building sciences, and promotes energy efficient Green Building Initiatives. Spray foam insulation used in the building envelope outperforms fiberglass insulation, becomes a superior air barrier, and defies traditional, and outdated building practices of attic and crawl space ventilation. Spray foam home insulation saves on energy costs and lowers utility bills. Spray foam insulation seals the entire �building envelope� of your home to prevent air and moisture infiltration. The US Department of Energy (DOE) studies show that 40% of your home's energy is lost due to air infiltration. This air infiltrates the home in the form of drafts through walls sockets, windows and doorways. Often times no expensive building wrap or additional vapor protection is required during construction when using Closed-Cell Spray Foam , saving money yet again. 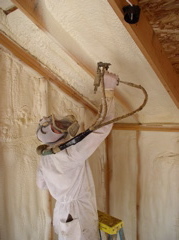 Spray polyurethane foam insulation has an aged R-value of approximately 6.0 per 1 inch thickness (depending on the particular formulation and application, higher values have been achieved), enabling it to provide more thermal resistance with less material than any other type of commercial insulation material. Spray Foam Systems are frequently used to insulate and protect a wide variety of residential, commercial, and industrial buildings. Monthly energy and utility savings of 30% or greater can be achieved when compared to the alternative insulation systems. The cost of a Spray foam insulation system can often be recovered in a short period of time, simply through energy savings alone. Traditional fiberglass insulation is only stapled, or placed into the wall cavities and does not seal the stud and wall cavities from end to end, or top to bottom. Air infiltration can pass through these gaps, making it far less efficient than Spray Foam Insulation. The foam not only adheres to, but forms to the walls and floors to create a tight seal and insulating barrier that stops this air leakage. Closed-Cell Spray Foam Insulation also boasts the highest R-value per inch than any other commercial material, (upwards of R-7.0, compared with Fiberglass at R-3.5) making your home more comfortable and less expensive to heat in the winter, and cool in the summer. Since Spray Foam Insulation acts as an air barrier, it also helps to reduce moisture infiltration, which is a source of dangerous mold and mildew growth in the home, and can cause severe health problems to its occupants. Moisture infiltration can also cause structural damage to your home or building. Protect your family and save money at the same time with spray foam insulation systems. Molds produce tiny spores. Mold spores waft through the indoor and outdoor air continually. When mold spores land on a damp spot indoors, they may begin growing and digesting whatever they are growing on in order to survive. There are molds that can grow on wood, paper, carpet, and foods. When excessive moisture or water accumulates indoors, mold growth will often occur, particularly if the moisture problem remains undiscovered or un-addressed. There is no practical way to eliminate all mold and mold spores in the indoor environment; the way to control indoor mold growth is to control moisture. Closed-Cell Spray Foam Insulation is the key. Spray Foam Insulation also reduces airborne sound making the home acoustically tighter and more private from room to room. Closed-cell foam has varying degrees of hardness, depending on its density. A normal, closed-cell insulation or flotation urethane is between 2 and 3 pounds per cubic foot. It is strong enough to walk on without major distortion. Most of the cells or bubbles in the foam are not broken; they resemble inflated balloons or soccer balls, piled together in a compact configuration. This makes it strong or rigid because the bubbles are strong enough to take a lot of pressure, like the inflated tires that hold up an automobile. The cells are full of a special gas, selected to make the insulation value of the foam as high as possible. The advantages of the closed-cell foam compared to open-cell foam include its strength which reduces rack & sheer stress, highest R-value, and greater resistance to the leakage of air or water vapor. The disadvantage of the closed-cell foam is that it is denser, requiring more material, and therefore, more expense. The choice of spray foam should be based on the requirements for the other characteristics - strength, vapor control, available space, etc. Both types of foam are commonly used in building applications. Some are inappropriate in specific applications. For example, you typically would not use open-cell foam below grade or on buildings on or near bodies of water especially in the humid tropical climates where it could absorb water; this would negate its thermal performance because water is a poor insulator compared to air. Closed-cell foam would be a good choice where small framing sizes need the greatest R-value per inch possible. Basically, the choice depends on the conditions of each installation. We routinely select from a wide variety of foam systems with varying characteristics, depending on the particular requirements of each clients' project. � The R-value of insulation materials is dependent on ambient temperature and wind conditions. Independent tests show that at 18 degrees F, with a 15 mph wind, the theoretical R-value of urethane foam drops from 19 to 18, while batt insulation drops from 19 to 7. � In retrofits with smaller existing framing sizes, this means that buildings can still be insulated to meet current code requirements. � In new construction this means that smaller framing sizes (lower lumber costs and larger rooms) can still be insulated to today's energy efficient standards. � Plumbing can be installed in outside walls without freezing because only a thin layer of foam is required between pipes and the outside sheathing. � This is effective in bays with steel columns, which have a very small space available for insulation between the steel and the sheathing. The R values per inch of some common insulation materials are listed below:. � Air leakage is the number one cause of poor building performance. Foam insulated homes out-perform conventionally insulated homes without requiring complicated and labor-intensive air sealing details. � Because foam is air tight, it performs better in windy conditions and resists R-value loss. � Batt insulation has virtually no air sealing ability and has to rely on other components of a total thermal envelope to maintain performance levels. � Air leakage at penetrations creates an environment for condensation. This affects overall performance and can compromise indoor air quality (bugs, mold, and rot). Condensation can also lead to premature structural failure in structural framing and sheathing materials. � Independent testing shows that urethane insulated buildings can perform as much as ten times better than today's energy standards. � This provides protection against moisture transport into the insulation with its related potential for condensation. Vapor that remains on the inside (the warm side) will not come in contact with cold surfaces where the dew point can be reached. � Imperfections in the vapor retarder are less critical with closed-cell foams. � Indoor humidity levels are more easily maintained at healthy levels if vapor cannot escape during dry winter weather. 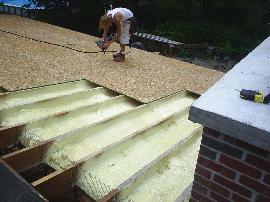 � SPF will not be damaged by roof leaks, foundation leaks, or condensation. � SPF can be used below grade and in masonry construction and not sustain damage from water penetration. � Foam will not compress or settle. � Spray Foam can help to resist wind shear. 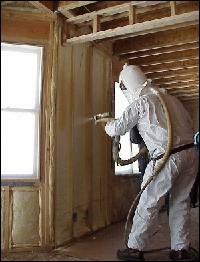 � Spray Foam can serve to reinforce exterior sheathing and windows. � Urethane foams are used in structural panels and other composite structures. � Spray Foam can be walked on or nailed into without damaging its performance. It can also be washed without damage. � Both open and closed-cell foams provide good sealing against air-borne sound transmission. � Both open and closed-cell foams provide good STC ratings against air-borne sound transmission. � No low-density insulation materials are effective against structure-borne sound. Double layer structural systems, resilient structural materials, or massive structures are the best defense against structure-borne sound. Toxic mold has recently come to the forefront as a major concern among architects, developers, contractors and homeowners. In the past decade, over 9,000 lawsuits related to mold have been filed in the US and Canada . In addition to the rise in mold-related damage liability and litigation issues, the building industry has also taken note of the health risks associated with toxic mold. As a result of the growing public health and remediation costs, the building and science communities have joined forces to promote environmentally friendly, mold-preventing building products like foam insulation. According to microbiologists, there are more than 100, 000 known species of mold and while most are harmless to humans, over three dozen species can be source of severe health problems. Mold growth is caused by moisture-filled air moving into the walls and roof cavities. Inadequate or poor air barrier system installation, a missing or incomplete vapor retarder and high levels of relative humidity also promote mold growth. Airborne mold spores can cause a series of long and short-term health problems which include respiratory problems, skin or eye irritations, headaches and chronic fatigues. Toxic molds are also being researched as possibly having a link to some severe illnesses such as cancer, and cognitive and neurological impairments. The most common structural damages of mold formation include rotting of wood and wooden structural framing. It can also cause damage to the existing insulation materials such as fiberglass batt and blown cellulose. According to the EPA, once mold has formed and depending on its spread and the damage caused, remediation can be a costly and lengthy process. According to estimates, cost of single abatement can be as much as $40,000. Although the EPA doesn't list any clear guidelines toward mold prevention, mold CAN be prevented. Since mold formation is directly related to moisture and air infiltration, an adequate air barrier and vapor retarder can prevent mold growth. Polyurethane closed-cell spray foam insulation performs as both a highly effective air barrier and a vapor retarder when used for insulation.